Blogger (previously known as Blogspot) is a free online application that allows you to setup a blog in just few easy steps. With wide variety of themes, intuitive interface and ability to modify HTML code, your blog will easily become unique and easy to read. To setup a blog, just login to the Blogger with your Google Account (if you don’t have one, you can create it in minutes) and pick a theme that you like. From that point on your blog is activated, and you can start posting articles in it, or try modifying it with easy-to-use interface and full support from our online help resources. Writing, editing and publishing of your content is as easy as it can get. Professional editor supports many text editing features, as well as the support for both Simple and HTML views of the article. With such kind of power over your content, you will have no problem to showcase any kind of web material on your blog. As an additional feature, you can even enable automatic e-mail notification that will help you to be in contact with your blog even if you are not actively moderating it. Blogger offers simplicity, powerful features, and extremely accessible way to manage and publish your content, without a need to be bothered about truly professional and advanced features of other blog services (such as Wordpress). Staring your own blog can be a challenging process, but if you have the content and you have the will, Blogger.com can offer you all-in-one solution for hosting, designing, updating, managing and monetizing your own internet blog. Starting from the large collection of modern looking blog designs, to tools for text editing and real-time visitor statistic, you can take full control over all the aspects of your creation, enabling you to always showcase to the public things that you think are worth publishing. Created in the summer of 1999 under the name of Pyra Labs, Blogger rose to the height popularity after it was purchased and renamed by Google in 2003, managing to become one of the top 40 most visited sites in the world. With the community counting more than hundred million users and countless visitors reading incredible amount of unique content daily, Blogger represents one of the most reliable, easy-to-use and popular blog publishing platforms you can find today. What are the basic capabilities of Blogger? Well, it offers everyone chance to create blog for free that will be placed under a subdomain of blogspot.com, making your initial investment truly minimal (and don’t worry, if you decide to remain under blogspot.com subdomain, you will never be asked for a any kind of subscription fee). Creation of the blog is easy and intuitive, leading you through the building process step by step, choosing basic template that can range from smooth fun ones to sharp looking futuristic ones, customizing site with your own color schemes or art, incorporating Google AdSense for earning money, various widgets, community chat and much more. 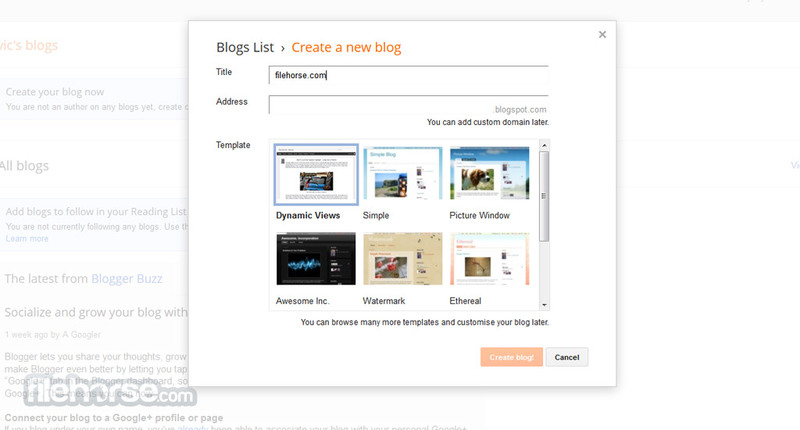 Create free Blog very easy with Blogger! The process of content uploading is streamlined with the fully-featured text editor that support basic image editing, image hosting, paragraph tools, and more. Majority of tools that is available on the full browser version of the service is also available on modern mobile devices, enabling you to post new content, moderate chat and see new updates not only from your blog, but also from other blogs posted by the incredibly large Blogger.com community. Blogger supports over 40 languages from all continents, including English, Arabic, French, German, Dutch, Hebrew, Hindi, Greek, Serbian, Swedish, Spanish, Malay and Hungarian. Stylish orange squared logo with white letter B is a logo that many people in the world today recognize as the logo of Blogger. The basic design of this logo is present on the entire Blogger site, mixing white, k blue in a stylish and modern way that is currently featured on all Google-owned services. 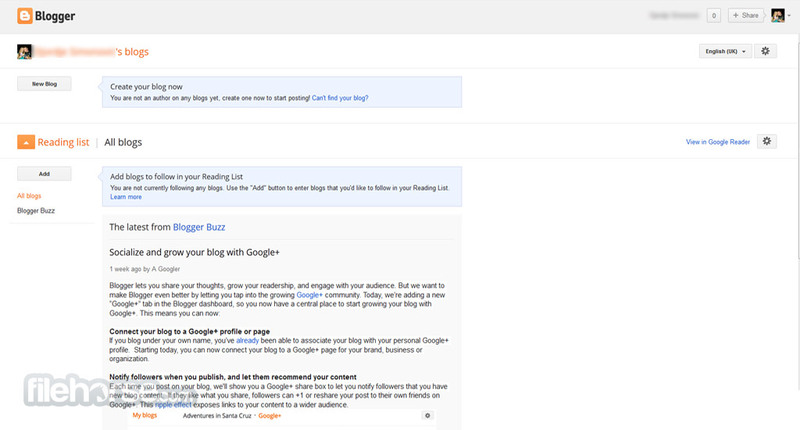 From the moment you arrive on Blogger.com you will be welcomed with the direct prompt to log in into your own Google Account. After that you will land on dashboard where you can see the updates from all other blogs you have found interesting, including all your blogs. This listing of updates is presented in a nice form, with enough space for all UI elements to be easily usable. Process of bloc creation is really streamlined, starting with the choosing of blog name, URL address and basic template, and later on leading to the more advanced steps that will distinguish visual look of your blog from all the others. Blogger accepts only Google accounts, and if you don’t have one you can get one in mere seconds (all you need to have is a valid email address). As for price, all visitors can read all the content on all Blogger subdomains, and can create their own blogs without any fee. You get access to all the basic features for content uploading and editing. If you want to move your blog to a new subdomain or you need professional-grade support or features, Bloggeroffers that also. 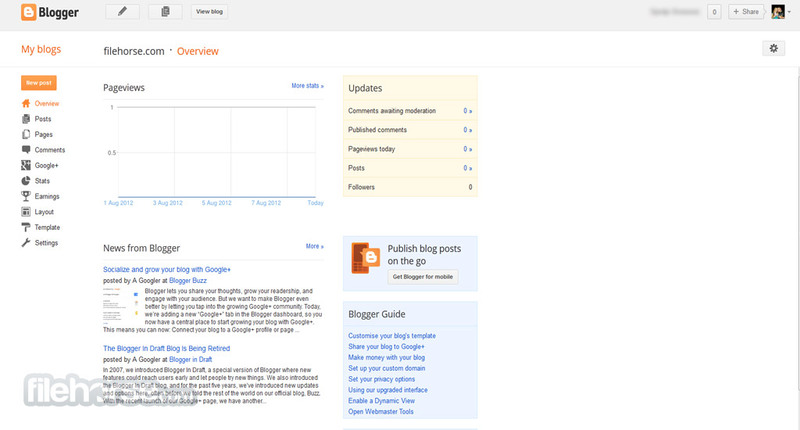 Bloggeris one of the best web services in the world for creation, management and reading user-created blogs. With streamlined editing tools and the built in user base that likes to discover new blogs, you would be foolish not to try this incredible free service. Create your free Blog today!